Executive Mosaic is honored to introduce Tim Reardon, vice president and general manager of the civil, defense and intelligence organization at Lockheed Martin, as an inductee into the 2016 edition of the Wash100 — Executive Mosaic’s annual selection of influential leaders in the government contracting arena. This is Reardon second year of selection to the Wash100. Reardon, an 18-year company veteran, is in charge of a business unit that delivers advanced systems, solutions and services to U.S. civilian, defense and intelligence community government customers worldwide. The team’s broad focus areas include national security, air traffic management, health, energy, space exploration, enterprise information technology, cyber and advanced analytics. 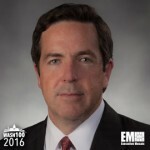 In April 2015, Tim expressed the company’s support for the Defense Department‘s new cyber strategy through continued collaboration and information sharing with government and industry partners. “[Lockheed Martin] is fully supportive of its goals to harden and integrate DoD networks to defend against cyberattacks,” he said. Reardon previously led Lockheed’s defense and intelligence solutions unit and served as president for the company’s enterprise integration group. He was also a CIA staff officer for 10 years before Lockheed and is a board member of the Intelligence and National Security Alliance and Fairfax County Chamber of Commerce. Executive Mosaic congratulates Tim Reardon and the Lockheed Martin team for their selection to receive this award.